The historic centre of Diso has beautiful ‘case a corte’ and some old palaces such as the 18th century Baronial Palace. The Mother church was built in the 18th century. the façade has a portal with two niches and statue of the saints. It has a Latin Cross plan inside there are some finely decorated altars, paintings of the 16th and the 17th century and two paintings with Our Lady of the Carmel and Elidoro when he is sent away from the temple. The painting of Our Lady with the Child is very interesting and is embellished with a golden frame. The small church of Our Lady of Constantinople dates probably to the 19th century and was restored in 1930. it opens only on May 3rd on St Giacomo and Filippo’s day. The church of the Virgin dates to the 17th century. 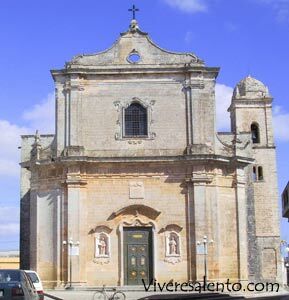 The façade has a finely decorated baroque portal while on the left wall of the church there is a fresco representing the Crucifixion. Inside there are some interesting paintings representing Our Lady of the Rosary, the Virgin and other saints, a wonderful wooden statue of the Virgin and an 18th century silver calyx. 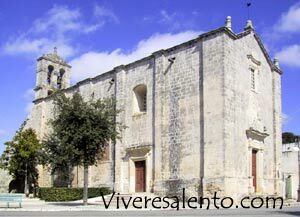 The Church of St Oronzo was built in 1656 because the population wanted to thank the saint for his intervention against the plague. Next to the church there is also a column with the statue of the saint. The church is aisleless and only one altar but three of its frescos are in good conditions. The church belongs now to the Corvaglias and opens only on august 26th for the Mass in honour of the saint. The Chapel of St Sisinno dates probably to the 16th century, it is in gothic style and was rebuilt after 1832 when a cyclone knocked it down. Next to the Capuchins’ Convent there is a nice church of the 17th century. The façade is richly decorated and inside there are 23 paintings and an epigraph says that the remains of St Costantino are buried under the high altar. The Church of Our lady of the Snow is the oldest religious building of the village. Inside there is a beautiful painting of the Virgin with a roman centurion. The patron saints of Diso are St Giacomo and St Filippo and the population celebrates them on May 1st. The nickname of the people of Diso is “unagnuli”, that means lambs. The lamb is certainly the symbol of this village since it is also on the civic coat of arms but the nickname comes from a legend. When the parish church organ had to be inaugurated the priest had prepared a big celebration and an organ concert for all the city and religious authorities. He prepared everything in detail but was also really worried, nervous and anxious. When the day of the inauguration came, the singer of the concert disappeared and he got into a panic, went in a sheepfold and came back with two lambs to replace the singer.